Although, for ease of use, still listed on this site under the heading 'Planets', Pluto was finally stripped of its full planet status and reclassified as a 'Dwarf Planet' in August 2006. The status of Pluto as a planet had been intermittently called into question many times before, due to its small size in relation to its neighbouring planets (it's nearly 10,000 times smaller than Neptune!) and its unique physical make-up of ice and rock. The factor which finally persuaded the International Astronomical Union (IAU) to declassify Pluto however was the discovery of a number of Kuiper Belt Objects (KBOs) of a similar if not greater size to Pluto in the few years preceeding its declassification. Not taking action at that point would have led to the inevitable classification of a number of other large KBOs as 'planets', eventually resulting in the number of planets increasing by the tens, with most of these being 'new' planets found in the outer fringes of the Solar System - small hard bodies bearing little or no resemblance to the 8 objects which we traditionally think of as 'The Planets'. Such objects, from now on, are to be termed 'Dwarf Planets'. The search for Pluto (named after the Roman God of the Underworld), which began shortly after the discovery of Neptune, was most associated with the astronomer Percival Lowell, a man more famous for his ideas about Mars than discovery of distant planets. Still, the idea of a 'Planet X' fascinated him and soon he began searching the heavens for this planet with a team of researchers, using his private observatory in Flagstaff, Arizona. After many years of trawling through photographs nothing was found until, 13 years after Lowell's death, a young amateur astronomer named Clyde Tombaugh finally discovered Pluto in February 1930. Since then this icy dwarf planet has fascinated many people the world over, yet not that much is actually known about it, as its sheer distance from us has so far prohibited any space missions to send probes near it, and makes viewing it from the ground harder too. However, this situation is changing - ever bigger and more powerful telescopes are helping us to better understand this dwarf planet, and a NASA mission is planned to send a space probe to Pluto. As we keep learning more details about this world, it becomes ever more intriguing. 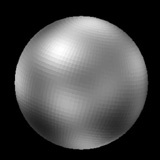 Pluto has an average Density of between 1.8 and 2.1 g/cm3, and is estimated to be composed of 50-75% rock mixed with ice. Proof of Pluto's icy surface temperature comes with the knowledge that its surface is composed 98% of Nitrogen, with traces of Carbon Monoxide and Methane, which can only be present as a solid under 70�K. Also noteworthy is Pluto's highly elliptical orbit, because although it's usually further from the Sun than any of the 8 planets, there is an period of time during its orbit when it's actually inside Neptune's orbit! This last happened in 1979 and serves to demonstrate just how much Pluto's distance from the Sun varies. At the moment it has recently passed its closest point and is slowly increasing its distance from the Sun. Pluto also has a thin atmosphere of Carbon Dioxide and Methane. This atmosphere is not permanent though and when Pluto gets too far from the Sun, it collapses. This is next expected to happen in 2020 or so, although we can't be sure as this process has never actually been observed. With a diameter of a mere 2,320 kilometres (about two thirds that of our moon) Pluto is smaller than any of the 8 planets, and yet, rather surprisingly, Pluto has a moon of its own; Charon. Charon is 1,210 kilometers wide, more than half the diameter of Pluto itself, and therefore holds the record of being the largest Moon relative to its planet or dwarf planet in the Solar System. It is considered very likely that Pluto and Charon were formed independantly of each other, unlike the Earth and our moon, due to the fact that its surface composition is thought to be mainly water ice, and thus very different to Pluto's, and also because it has a much lower density (approx 1.2g/cm3 to Pluto's 1.8-2.1g/cm3). Charon circles Pluto in a slightly eccentric orbit (0.0076), probably due to a recent collision with a sizeable object. Another peculiar feature had by Pluto and Charon though is that Charon orbits Pluto in the same 6.387 days that Pluto takes to rotate, keeping the two locked in synchronous rotation. Charon therefore behaves like our moon in this respect - it always keeps the same face towards Pluto; the difference in this case however is that Pluto also always keeps the same face towards Charon. Well, not much to say here, except that it was discovered in 1930 by american astronomer Clyde Tombaugh and frozen methane was discovered on Pluto's surface in 1976. 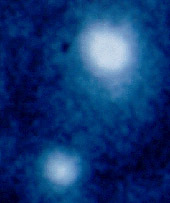 Then in 1978 astronomers James Christy and Robert Harrington discovered its moon Charon. In August 2006 the IAU changed Pluto's status from 'planet' to 'dwarf planet'.